We'll light up your life - outdoors that is! 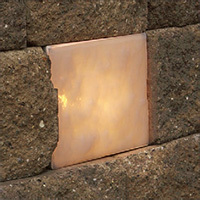 With our wide range of hardscape lighting for Cambridge Pavingstones, Wallstones and Outdoor Living Rooms. LED (Light Emitting Diode) lights from Cambridge meet the latest and most exciting technological advancement in the lighting industry. The small, solid bulbs are extremely energy efficient and long lasting. The 4 Kits make LED benefits available for preferred outdoor applications and come complete with Remote Dimmer and patented Easy Plug™ Installation System allowing fixtures to be daisy chained together without cutting or splicing. Low voltage outdoor DC power supply (transformer) included. Power supply cables in lengths other than those provided with each kit are available at an additional cost. Cambridge LED Lights must be used with the Cambridge recommended power supply. Showcase treads, walls systems, columns and pillars without the fear of bulbs burning out. 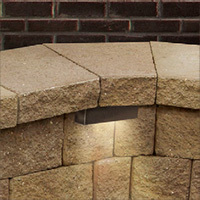 Cambridge LED Hardscape Lights are rated to last 50,000 hours and are designed for easy removal and replacement. The T-cable extends 9 inches in two directions for proper placement. Each 5mm iluma light strip is designed to blend into most composite, vinyl, aluminum and wood railing and for use with Cambridge Walls and Outdoor Living Room Components. The pre-made light strip comes in 3" and 6" lengths with bulbs strategically placed for optimal lighting. 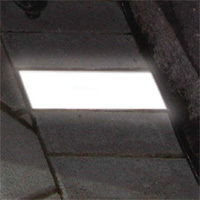 Brighten walkways and garden beds and as accent lighting at the perimeters of virtually any outdoor pavement. 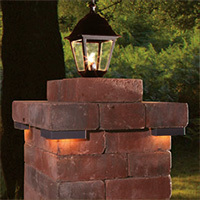 Each Path Light Kit includes five die-cast aluminum fixtures available in choice of 2 styles (Glass and Hat). Uplights are designed to illuminate focal points such as trees, shrubs and architectural details of your home more efficiently than traditional, incandescent flood lights. 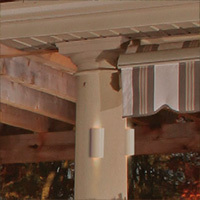 Each outdoor uplight kit includes four fixtures. Thanks to our research and development team, Cambridge offers an innovative "green" lighting option - a totally sustainable alternative to both conventional solar and AC-powered paver lights. No wires, no bulbs. No ancillary components required. 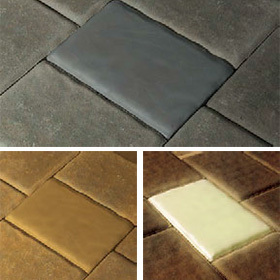 A tough and permanent, surface treatment that glows-in-the-dark is permanently affixed by Cambridge to our 6 x 9 Pavingstones.